A random mugging turns violent and results in Samantha Moore becoming comatose and suffering brain trauma and other physical problems. She awakes embittered toward life, tormented by pain and dreams of her attack. In an effort to facilitate her recovery, her fiancé and parents reserve a cabin by the lake and a physical therapist as a caretaker. Is this the hoped for new beginning for Samantha or another step in her downward spiral? 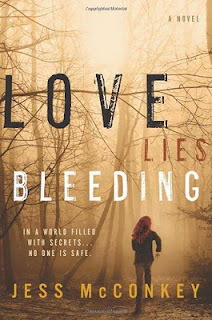 The answers lie in Love Lies Bleeding by Jess McConkey. Prior to the mugging and vicious beating, Samantha Moore was a serious business woman and an asset to her father's firm. She was also an asset to her fiancé, Dr. Jackson Van Horn. Now she experiences severe mood swings, is in constant pain from the damage to her leg and head trauma, and worse has to deal with the profound side effects from the medications supposed to be helping her. Jackson and her parents feel that the best thing for her is to get away from it all, so they set up a "retreat" in the country beside a lake. Jackson had spent part of his youth there and has fond memories of summers at the lake. Unbeknownst to Samantha, her family has also arranged a caretaker. Samantha doesn't have anything against Anne Weaver, the physical therapy assistant, that has been hired but she doesn't want a care taker. She's tired of people telling her what to do and how to feel. She's tired of taking medications that are supposed to help and wind up causing more problems due to their side effects. She's just tired. As Samantha gradually gives in to her surroundings and befriends Anne, she also begins to experience some bizarre dreams. But these dreams aren't about her. These dreams seem to be rooted in the past, the past of the woman that disappeared from the cabin more than 25 years ago. To make matters worse, she also imagines that she sees this woman on the dock and periodically smells her perfume and cigarettes. Anne is experiencing her own set of issues. Her teenage son is insistent that he wants to become a musician. Anne's dreams of becoming a model were dashed when she left home and traveled to New York. She doesn't want her son's dreams to become broken or for him to suffer the same disappointments she had in her youth. Can Anne recognize that she can't control her son's life forever before she pushes him too far away? 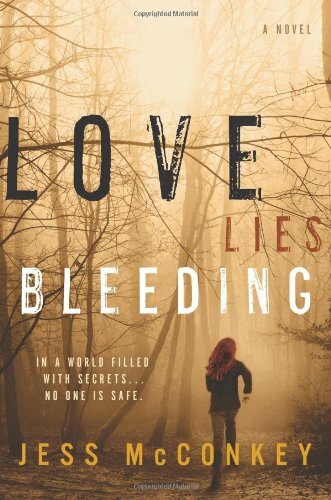 To say that everyone has issues in Love Lies Bleeding is putting it mildly. Jackson is suffering from abandonment issues corresponding to his mother's death and behavior prior to her death. Samantha's father is a control freak and presumes that he has the right to tell Samantha, a thirty-five-year-old woman, what to do, how to do it and when it should be done. Anne also has control issues when it comes to her expectations for her son. Samantha has medical and physical problems but those can be gradually overcome, her most pressing issues relate to her fiancé and family. Can she discover what she wants and how to achieve it before it’s too late? Can Samantha and Anne discover the truth behind the mysterious disappearance from the past? I rather enjoyed Love Lies Bleeding until the end. Samantha and Anne were fully developed characters, with personality to spare and likeable even when they were unpleasant. The story line was believable enough and the action and tension build until the end where everything just petered out. There's resolution to the story but it felt weak and flat after all of the prior tension. Love Lies Bleeding is a decent read, although it does seem to get bogged down with minutiae from time to time. Disclaimer: I received this book free from BookTrib. I was not paid, required or otherwise obligated to write a positive review. The opinions I have expressed are my own. I am disclosing this in accordance with the Federal Trade Commission's 16 CFR, Part 255: "Guides Concerning the Use of Endorsements and Testimonials in Advertising."